Hello Loves! Guess what I just got in the mail today?! 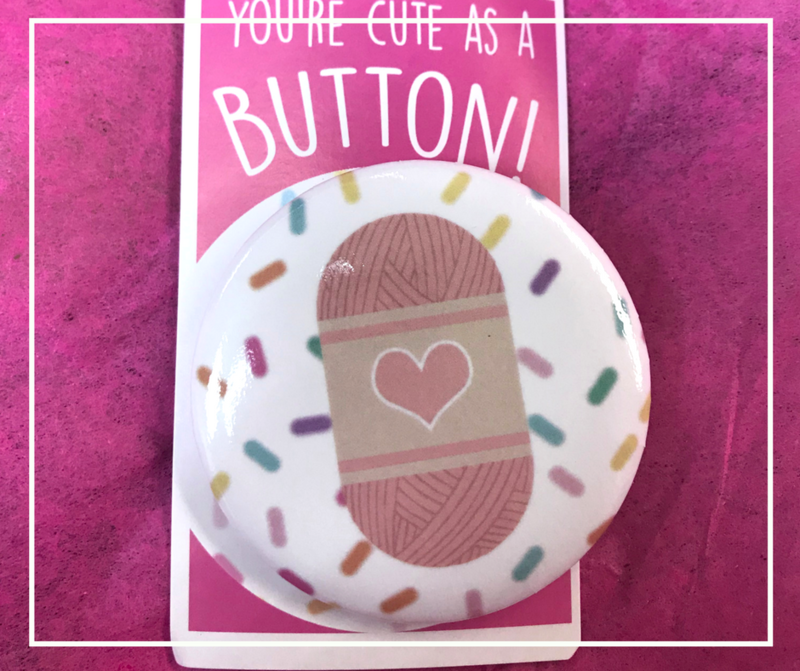 Happy Yarn Mail from Ashleigh of Sewrella! I just wanted to share what awesome goodies I got in this months subscription. I am now even more excited to see what Ashleigh comes up with for the next Happy Yarn Mail! I was so happy when I saw this cute packaging come in with the mail. It’s like a little surprise each month just for me to satisfy my yarn addiction without breaking the bank. Lets get to the good stuff shall we! 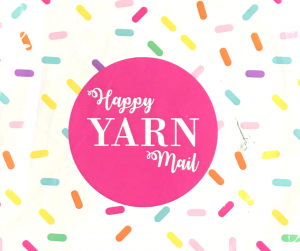 What Exactly Is Happy Yarn Mail? Happy Yarn Mail is a monthly subscription that includes an exclusive crochet pattern designed by Ashleigh herself. This pattern is never posted to her blog or put out there for anyone else. Only HYM subscribers can get their hands on these cute patterns. You will also receive all the yarn and materials you need to make the pattern (crochet hook not included). Lastly you will receive a secret link for an exclusive video tutorial of the pattern making these subscriptions perfect for all level of crocheters! So what does this awesome subscription cost? Only $19.95 per month. That price includes shipping so there are no other unknown costs that will be added when you check out. So long story long, you can get all these awesome goodies for less than $20 a month! Note: Your box will ship the last week of the month you order it (i.e. July boxes will ship between July 25 & 30 regardless of when the order was placed). Ashleigh just informed me that 1 lucky subscriber will win an entire year of Happy Yarn Mail FREE! The winner will be chosen from anyone who signs up for the recurring subscription (anyone who currently is signed up for recurring subscriptions is already entered!) for the month of April. The cut off is whenever HYM sells out for April so it’s best to subscribe sooner rather than later to ensure you’ll be entered and receive Aprils box! How will you know if you’re the selected winner? 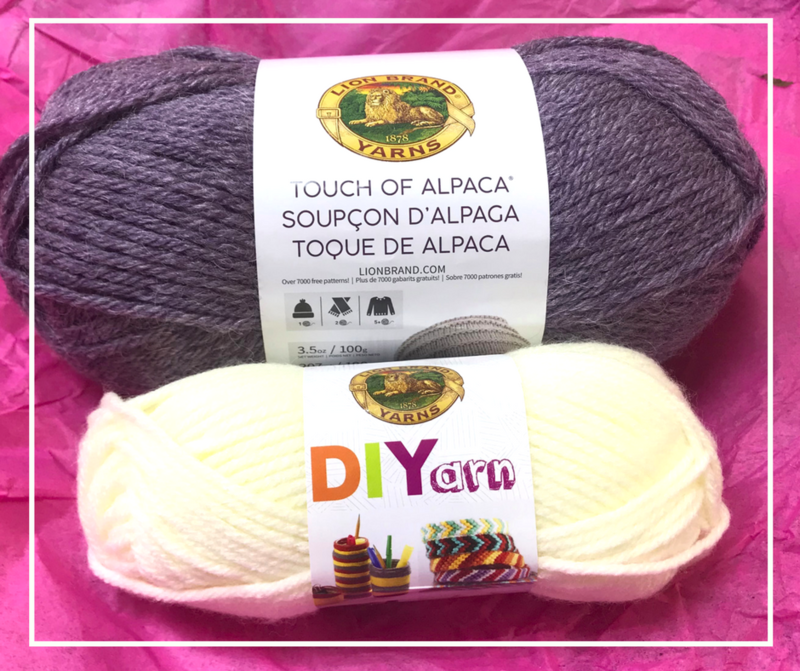 You will receive a special “golden ticket” in your April Happy Yarn Mail kit! How neat is that? I wish you all good luck and I can’t wait to see who the lucky winner will be. What Came In This Months Box? First things first. Lets talk about the yarn that came in this months subscription. Lionbrand’s Touch of Alpaca was the main yarn (color Purple Aster). All I can say is that this yarn is SOFT. Like you just wanna rub the skein against your face all day its so soft. I’ve been wanting to try out this yarn for so long but I was so busy working on other projects it got pushed lower on my to do list. Now I have no excuse (nor desire!) to put off testing it out any longer. I know I will definitely be using this yarn for some future projects down the road (maybe a sweater 😉 I know its spring but sweaters are bae). The secondary color is a mini skein of Lionbrand’s DIYarn. It was the perfect complimentary yarn for this project! 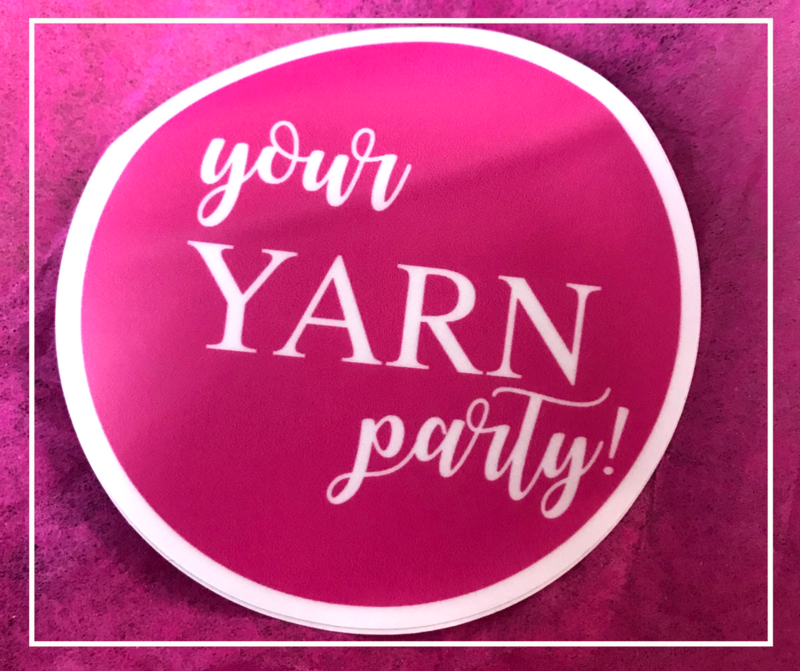 The next two things I immediately was drawn to are the “your YARN party!” sticker and the gorgeous pin that was included in this months package. I think that sticker will go great on my Inspo board. I have had my eye on so many yarn related pins on Etsy lately, so getting this adorable little guy was such a pleasant surprise! 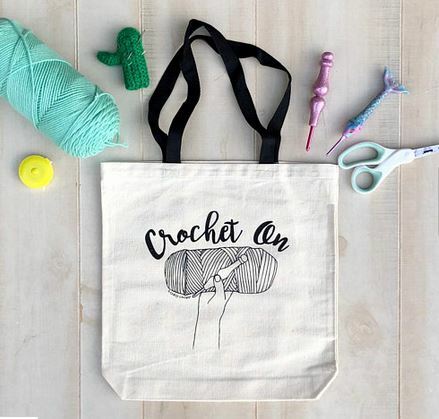 I have been eyeing a “Crochet On” bag that Ashley from Acraftyconcept designed recently, and I know this pin would go so well with the adorable hand drawn graphic (I know she impresses me too guys) on that bag. You can check out her adorable crochet bag on her Etsy (pictured at end of post). Saving the best for last…. the pattern. 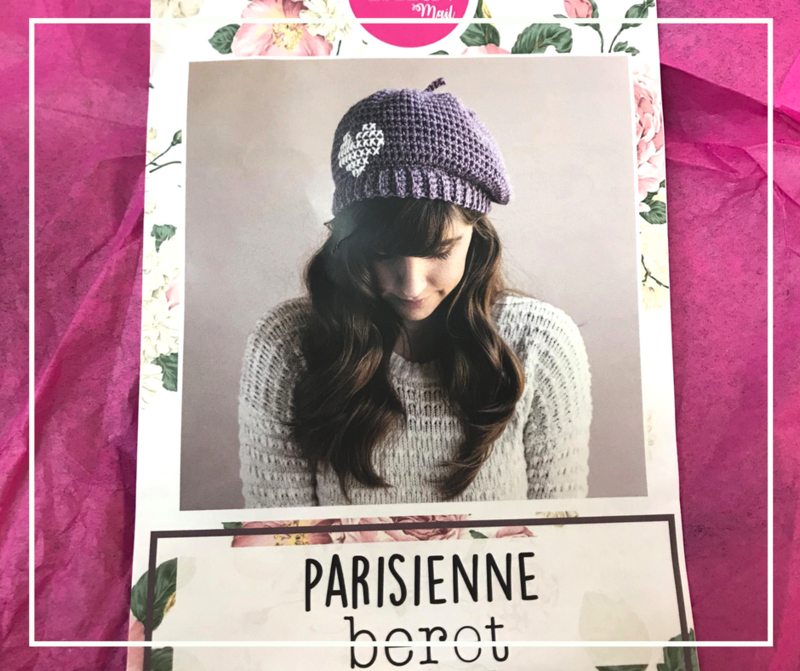 How about this adorable Parisienne Beret Ashleigh designed for this months Happy Yarn Mail! Not only are the directions made on a full color pamphlet with large easily readable font, but her pattern is extremely well written and easy to follow. 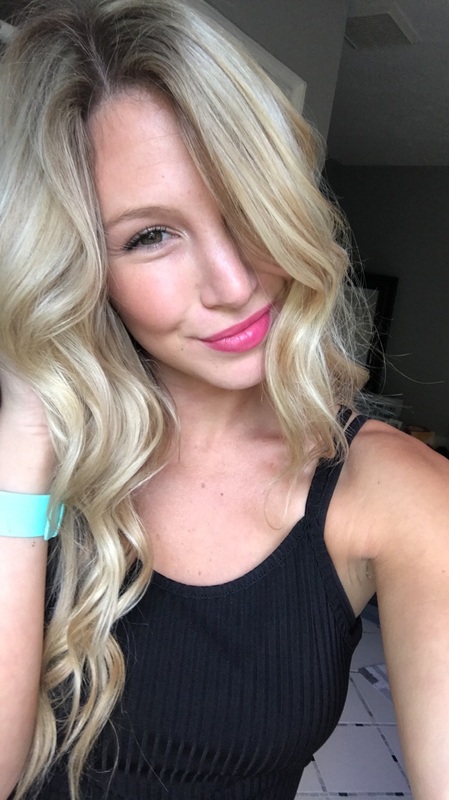 As if that wasn’t already enough, Ashleigh went above and beyond and included a secret link to a video with further instructions. Brilliant. Maybe something I will start adding to my patterns here in the near future. Thank you Ashleigh for the inspiration and I cannot wait to open up next months subscription! So remember in my Yarn Hints and Tips post where I talked about how to save money on yarn, and I stated that I need to get help for my yarn addiction? Well, I think that this monthly subscription is a great happy medium. It will allow me to test out new yarns without going to the craft stores and getting suckered into buying 10 new yarns I don’t even have projects for yet! I’m a sucker for a good sale… This will allow me test new yarns AND give me a project to pair with it all in one cute little package delivered right to my doorstep! 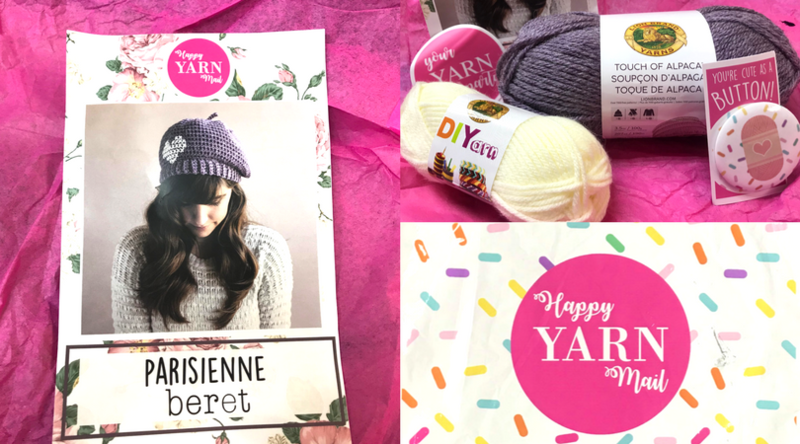 So if you love testing out new yarns and patterns without breaking the bank, definitely check out HYM created by Ashleigh of Sewrella. You will not regret it!